Ishita Khanna’s passion for mountains and the environment took her to scenic Spiti in Himachal Pradesh. At a time when climate change is threatening livelihoods across the world, Ishita is helping the local community in Spiti lead better lives and build a sustainable environment. Manu A B finds out more about one of India’s leading social entrepreneurs. Fourteen years ago, Sonam was one of the many unemployed youths in Spiti who did odd jobs for a living. He hardly knew the importance of Spiti’s rich flora or fauna, especially about a wild berry that grew in the rugged mountains of Himalayas. Cut off from the rest of the world for almost six months due to heavy snowfall, the villagers of Spiti - living in some of the highest points in Asia – had few options for sustainable livelihood and hardly any regular income for many years. All this changed after they discovered the nutritional and medicinal value of seabuckthorn, a wild berry rich in vitamins, minerals and fatty acids, which could be marketed as a magic recipe for good health. 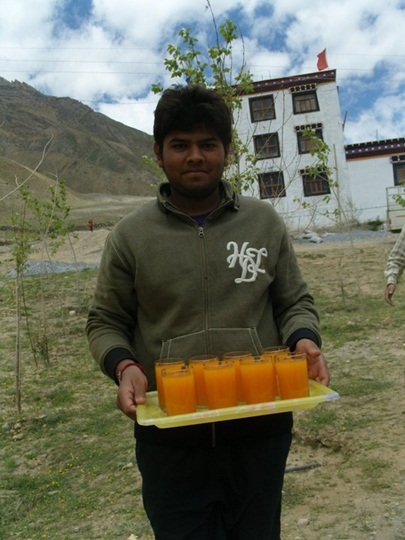 Thanks to a unique initiative by Ishita Khana to improve the quality of lives of the 12,000 odd villagers in Spiti, many families have begun cultivating seabuckthorn, selling it under the organic brand named called ‘Tsering’ (which means blessings for life), which is now available across India. 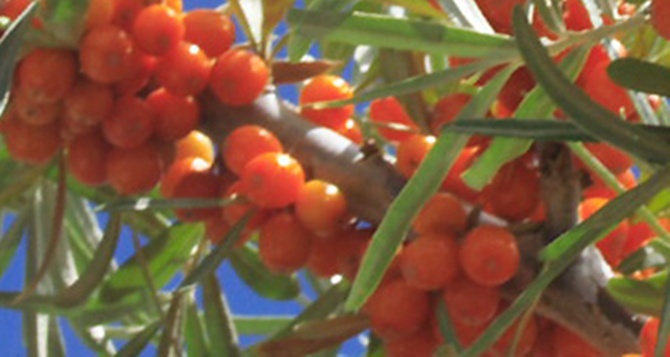 “Locals who were unaware of the potential of seabuckthorn were not growing it. We initiated a project to set up a processing unit to make juice, jam, tea and fruit drink concentrate. 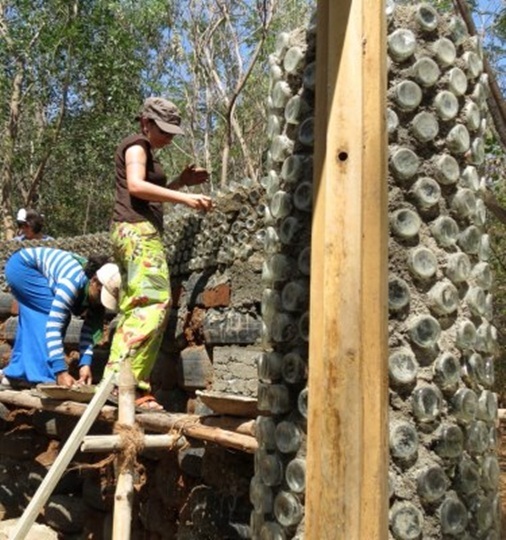 This project has increased income especially for women. We have been able to educate the community on the value of preserving this wonderful berry,’’ says Ishita Khanna. People quickly adopt practices if it makes money for them. So by marketing the seabuckthorn products, other cereals and pulses into useful and nutritional products, Ishita has been able to conserve Spiti’s scare and precious resources and made the villagers financially secure in the process. Besides promoting the farming of seabuckthorn, Ishita has also trained people in technical aspects of food processing and linked the finished products through the right marketing channels. 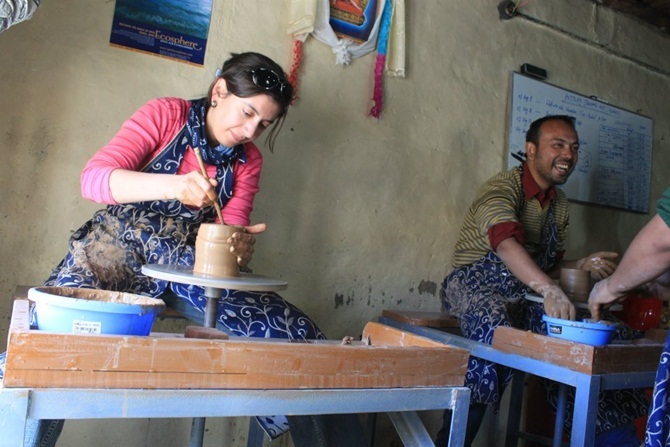 Ishita also promotes handicrafts and Thangkha paintings made by the locals. “By linking economics with conservation, we have been successful in preserving this plant. 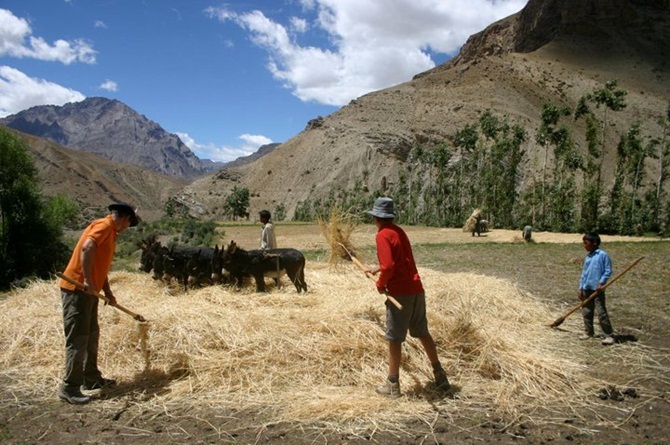 By promoting indigenous products, we ensure the conservation of Spiti’s diverse traditional crops and fruits, promote organic agriculture and enhance the livelihoods of the local population,” explains Ishita. 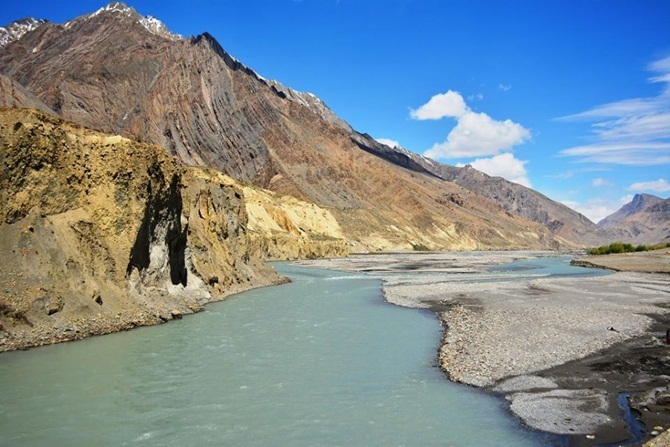 At an altitude of 17,000 feet above sea level, Spiti in Himachal Pradesh is one of the most beautiful places in the world but for people living there, it is a harsh life without even the basic facilities. With temperatures ranging from -30 degrees in winter to above 30 degrees in summer, the dusty and dry weather conditions make life tough and rigid for its people. Frequent power cuts which stretch across days together, bad roads and poor infrastructure are other issues that badly affect people. 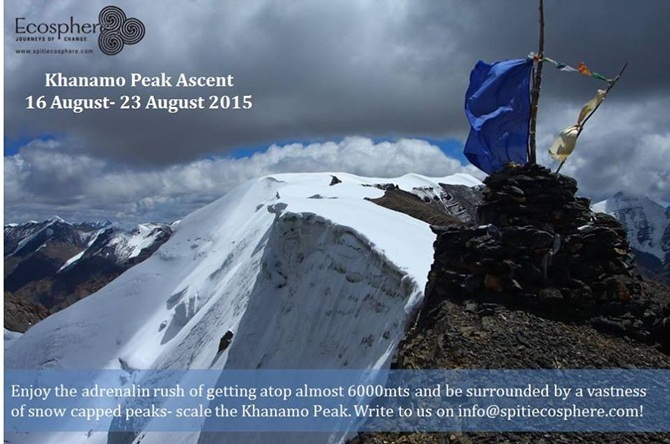 For nearly 6 months during winter, Spiti turns into a cold desert and is cut off from the rest of the world. 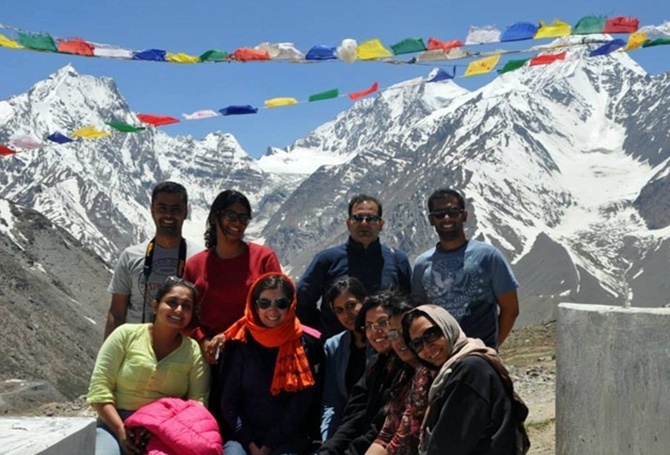 “Living in Spiti is an unforgettable experience”, says Ishita Khanna, who has been working relentlessly to improve the livelihood of the poor people in the remote villages of Spiti. After doing her masters in social work from Tata Institute of Social Sciences, Ishita joined rural development organisation, CAPART, where she worked in the remote parts of Himachal Pradesh. She observed that though the place is blessed with rich natural resources, the villagers were unaware of its benefits. In an attempt to retain the magical land with all it beauty and help its simple and friendly community, Ishita with a group of friends started Ecosphere. Of the 12 employees, only two including Ishita are outsiders. “The idea of setting up Ecosphere was to promote eco-tourism, help the struggling local community with better income generation avenues and preserve the environment with renewable sources of energy and cut down on carbon footprint. Conservation happens best when their livelihoods are directly linked to it,” says Ishita. Another initiative was to stop the conventional practice of burning firewood to stay warm during winters, which had a detrimental effect on the environment. 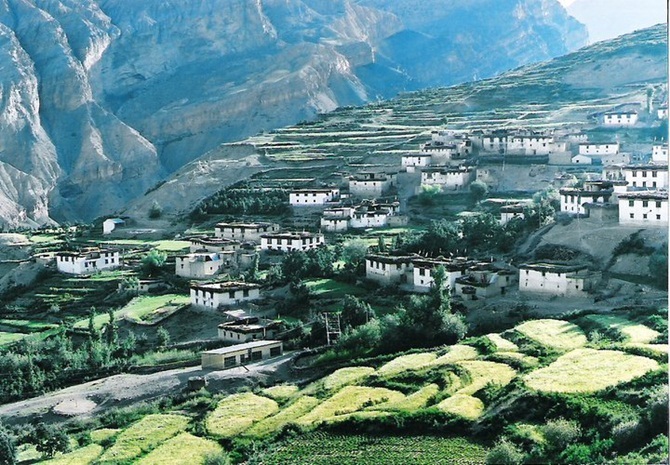 Fifteen years ago Spiti was not in any of the tourism itineraries. But now many tourists from India and abroad are discovering its pristine beauty. “While tourism has its pros and cons, we are helping tourists with unique programs and making them aware of responsible tourism, where they can work with the community to build solar-passive homes which retain heat inside the houses or green houses for growing vegetables. At the same time, the local community benefits with home stays. The home stays are conducted on a rotational basis so no one really competes with each other. Every house gets a chance to accommodate tourists,” explains Ishita. Born and brought up in Dehradun, Ishita was always fascinated by the mountains. 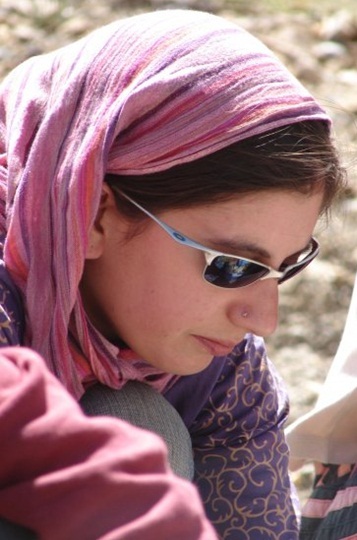 She has also done advanced mountaineering courses from the Nehru Institute of Mountaineering. Her trekking experiences brought her closer to nature and she was determined to work for its preservation. Ecosphere has taken remarkable initiatives to ‘reduce, recycle and reuse’ products. To cut down the usage of bottled water, the tourists are provided with a water filter at the home stays. They are offered free drinking water from the Ecosphere shop at Kaza, the headquarters of Spiti. Tourists are sensitised about the delicate ecology and the need to preserve its rich heritage. The waste materials like crushed mineral water bottles are being used in insulating solar passive homes in Spiti and waste tetra packs are recycled to make tissue paper. Due to the adverse weather conditions, they could not grow the vegetables in the villages. Procuring vegetables from town which was 8-10 hours drive was one of the biggest problems for villagers. This made it expensive and also increased the carbon footprint. Ecosphere’s initiative to set up greenhouses has been a path breaking initiative. 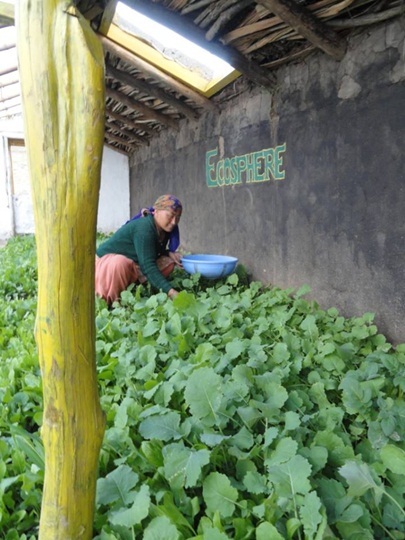 Ecosphere has set up 100 green houses for the villagers and the monasteries, where people actively grow vegetables for the community. Renewable energy projects have been another big success. Ecosphere has built 500 solar-passive houses. Ishita and her team’s relentless efforts have seen a drastic reduction in the usage of wood, which in turn reduced black carbon emissions. “Ecosphere continues to work on economic empowerment with the sale of organic products, conservation of the environment and introduction of several environment-friendly products like solar lights, geysers, cutting down fuel consumption. The best part about the venture is that all the profits are ploughed back into supporting the people and sustaining the environment-friendly measures,” points out Ishita. Life in Spiti is challenging but the simple life here is one of Ishita’s most prized possessions. There have been several unforgettable experiences for Ishita living in the remote villages. Once she was stuck in a village due to floods and had to walk 50 kilometers to reach a safe destination. She was also held up in a village, cut off from the rest of the world for two weeks, when there was heavy snowfall. 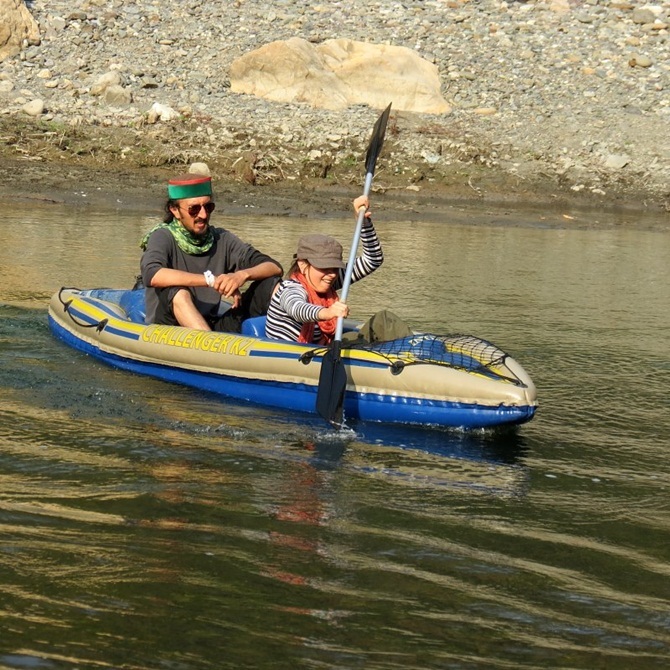 For someone who loves adventure, these incidents only reaffirmed her capability and commitment to work more vigorously. 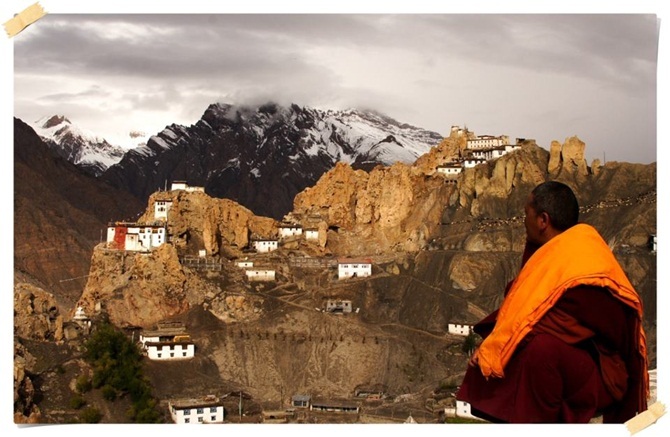 “Happiness and peace are the biggest gifts Spiti has given me. Money is important. It is the means to an end but not the end itself. Money can’t buy you everything. I would find it difficult to adjust in a city. I find life here more exciting and endearing,” says Ishita. City life is too commercial and complicated, says Ishita. Consumerism and advertisements regularly bombard people creating new needs whereas life in villages is truly fulfilling without any of those products. 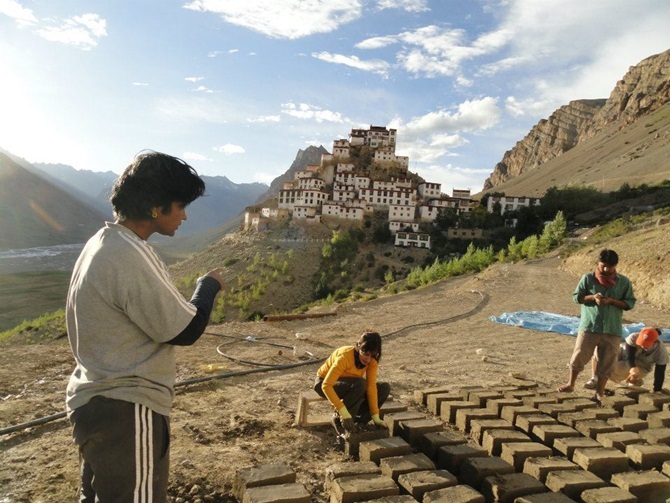 Spiti has also taught her how to value the precious resources, love nature and live in harmony. 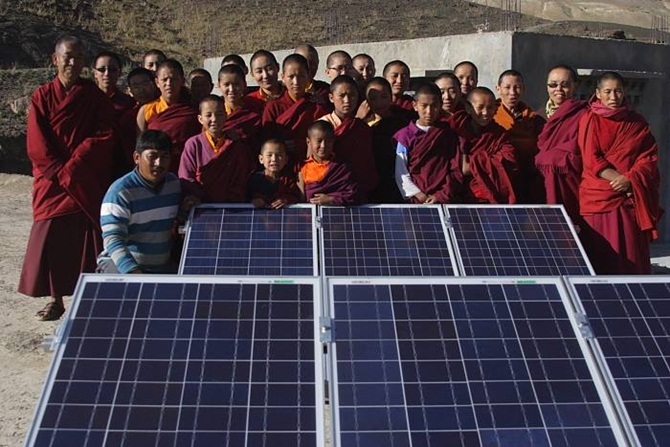 A group of nuns for whom Ecosphere installed a solar panel for lighting, told her that they remember Ecosphere in their prayers every evening, which is one of the biggest compliments, says Ishita. A solar pumping water station is the next big project in the pipeline. This would need an investment of around Rs 500,000. “People have to walk long distances to get drinking water. With a solar water station, we plan to reduce the burden on people,” says Ishita. With ambitions soaring as high as the Himalayas that surround her, Ishita dreams of scaling up activities in the villages building more self-reliant communities who can even run their own off-grid power stations, sustain the ecologically sensitive areas living in perfect harmony with nature. Ishita welcomes anyone who is keen to work as a volunteer or is ready to contribute funds to build renewable energy projects that places like Spiti rightly deserve. 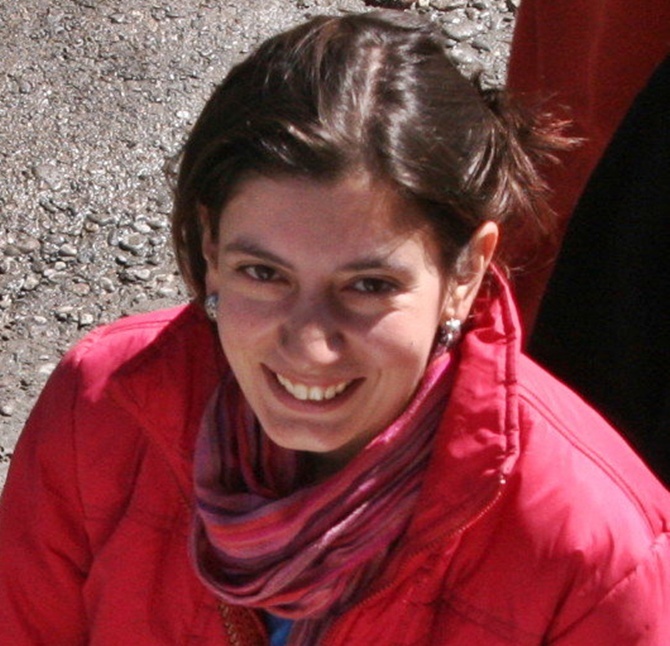 If you would like to help, you can mail her at ishita@spitiecosphere.com or call her at 94188 60099. Amazing story of an IITian who invented a $1 microscope!